Which weighs the most? 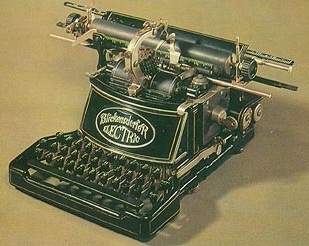 The motor alone from a plastic-cased Adler Gabriele 2000 electric portable typewriter, or the whole thing in a Blickensderfer 6-Featherweight aluminium portable typewriter? Answer at bottom of post. Yesterday's post about the 1902 Blick Electric typewriter got me pondering on some weighty questions: About weight, portability, electric typewriters and, as Dwayne suggested, the questionable advance of technology. 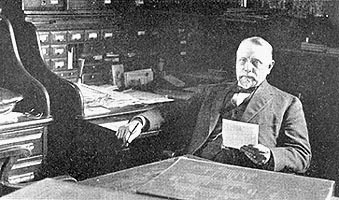 OK, so George Canfield Blickensderfer (or Sir Cody Lovell Blickensderfer, as the people at Wikipedia would have us believe) failed to convert the world to electric typewriters 110 years ago. But what did the Blick Electric weigh? I wondered. 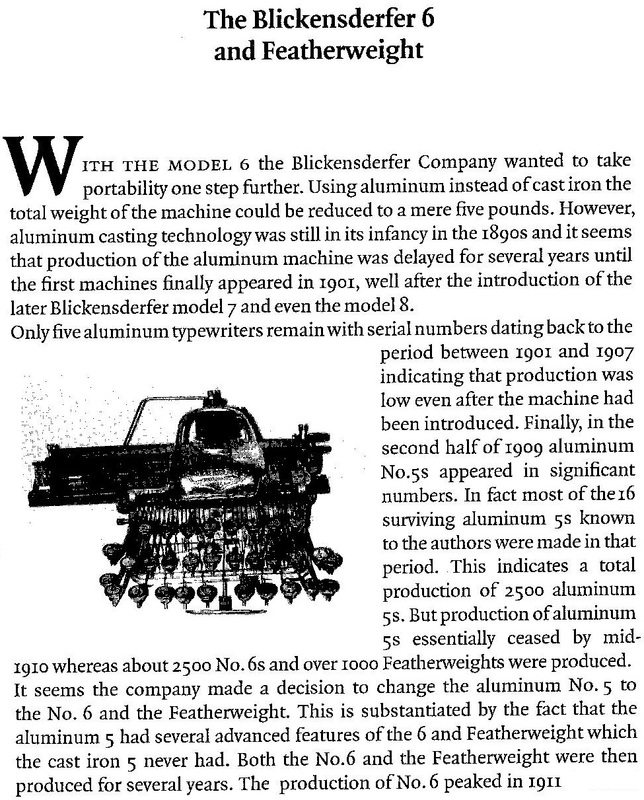 After all, it was not just a radical departure in the way Blickensderfer's typewriters were powered, but inevitably from his previous preoccupation with lighter, smaller machines. George Blickensderfer (yes, Wikipedia, it's George, not Cody) was a bit like another, later George - George Lucas - who played with our heads with the prequels and sequels of Star Wars movies. 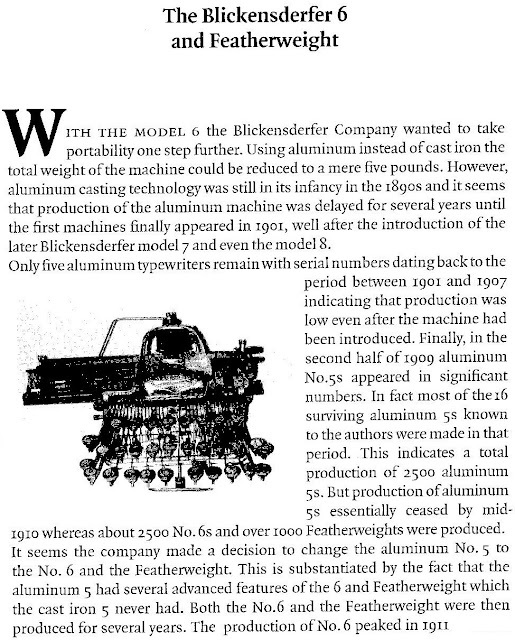 Bear in mind, the Blick 6 emerged at the same time that Franklin (Frank) Sebastian Rose was starting to work with aluminium to produce his Standard Folding typewriter - the then ultimate in portability for typewriters. In the 1930s and 40s, the cudgels for small, light, compact portable typewriters were taken up in Europe, where the Hermes Featherweight-Baby, Gossen Tippa, Groma Kolibri and Rooy were produced. In all these cases, weight and compactness were obviously the overriding factors. Some years ago, I was given an Adler Gabriele 2000 electric portable typewriter - now there's a misnomer if ever there was one: "electric portable typewriter!" "Portable" as far as the power lead leads, which is about three feet from the closest power outlet. What's more, these things weigh the proverbial ton. The Adler Gabriele 2000 electric weighs 17 pounds! Portable!? Anyway, this machine wasn't working. Not being a great fan of the Adler Gabriele or Contessa, manual or electric, it didn't concern me much, so I decided to take the thing apart to see what made it tick (or, in this case, not tick over). I don't know a lot about electrical matters, as fusing my house last week while trying to fix a bedroom light will show. But I did find what had caused this Adler Gabriele to stop working - a moth had got into the motor! Imagine a moth stopping a Blickensderfer from working? No way, Jose! Anyway, I took the motor out and realised straight away that it was contributing a substantial amount to the overall weight of the typewriter. Five pounds? Hang on, isn't that what the Blickensderfer 6-Featherweight portable typewriter weighs in total? Yes, spot on: same weight for both. Five pounds! Five pounds for the Adler's motor alone! So much for the march of technology. You're shipwrecked on a desert island, right? You need to write-print a document - a letter, say, to put in a bottle. With your last reserves of energy, you have somehow managed to lug ashore from the shipwreck a 17-pound, late 20th century Adler Gabriele 2000 electric plastic-cased portable typewriter. The seagulls have meanwhile dropped an early 20th century Blickensderfer 6-Featherweight aluminium portable typewriter at your feet. Plus a near-empty can of WD40 was washed ashore. And there are moths flying about. One typewriter uses a nylon ribbon, the other has an ink pad - a 110-years-old ink pad, mind you. But, hey, sorry, there's no power supply. No contest, really, is it? One squirt of WD40 on the Blick ink pad and, hey presto, away you go, typing your document merrily into the 21st century. In case you're wondering, this typewriter still types beautifully. The Blick is an elegant writing solution. I will resist your temptation as the more run of the mill Blick machines appear to be the gateway to the addiction known as Early Typewriter Collecting. The truth? If I could tell a good one from a bad one in online auctions, I would probably give in to the Blick path to ruin. Your overall point is well taken. We take a lot of infrastructure for granted in the operation of our gadgets and conveniences. Remember poor Gilligan and the bicycle generator? The Adler though, does indeed weigh more than Jupiter. I fear it's made of depleted typetranium. I'm not sure about the desert island analogy. The aloominum would be ate by the salt, I'm told. The Gabrielle, being indestructible, apart from the moth, would sink to the bottom of the ocean, dragging the owner with it, unable to let it go. I have a white Gabby 2000, now mellowing into a cream old age. Made in 1978, its still a perfect typer. If the motor goes though, I know where to come for a spare. Keep up the good Blicksderfing.